Op of voor za. 20 apr. MCSA Windows 10 Complete Study Guide will guide readers through the new Exam 70-698, Installing and Configuring Windows 10, which is the FIRST required exam for the new MCSA Microsoft Windows 10 certification* and Exam 70-697, Configuring Windows Devices. Certification candidates will need to know how to perform the following tasks: * Implementing Windows * Preparing for installation requirements * Installing Windows * Configuring devices and device drivers * Configuring and supporting core services * Configuring networking * Configuring storage * Configuring data access and usage * Managing and maintaining Windows * Configuring updates * Monitoring Windows * Configuring system and data recovery * Managing identity * Planning desktop and device deployment * Planning and implementing a Microsoft Intune device management solution * Configuring networks * Configuring storage * Managing data access and protection * Managing remote access * Managing apps * Managing updates and recovery This COMPLETE study guide will cover 100% of the Exam 70-698 and Exam 70-697 objectives, real world scenarios, hands-on exercises, and challenging review questions. The book will also dive deeper into some of the more complex topics and technologies. Finally, the book will include Sybex's comprehensive online learning environment with an assessment test, bonus practice exams, flashcards, searchable glossary, and videos for chapter exercises. 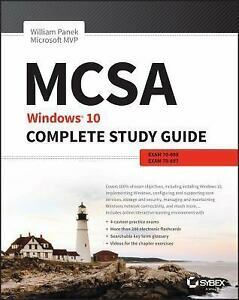 *NOTE: Both Exams 70-697 and 70-698 are required to earn the MCSA Windows 10 certification. Exam 70-698, Installing and Configuring Windows 10, is the FIRST required exam and should be taken BEFORE Exam 70-697, Configuring Windows Devices. The correct exam sequence to earn the certification is: 1) Exam 70-698, Installing and Configuring Windows 10 2) Exam 70-697, Configuring Windows Devices The go-to MCSA prep guide, updated for Windows 10 and the new exams MCSA Windows 10 Complete Study Guide is your comprehensive resource for taking both Exams 70-698 and 70-697. Covering 100% of all exam objectives, this study guide goes beyond mere review to delve deeper into the complex topics and technologies to help you strengthen your understanding and sharpen your skills. Written by a veteran Microsoft MVP, this guide walks you through MCSA skills in context to show you how concepts are applied in real-world situations. Hands-on exercises speed the learning process and facilitate internalization, while review questions challenge and test the depth of your understanding. You also get access to the Sybex interactive online learning environment, featuring flashcards, videos, an assessment test, and bonus practice exams to face exam day with confidence. The MCSA certification process has changed; Exam 70-698 tests your skills in installing and configuring Windows 10, and then Exam 70-697 gauges your abilities in configuring Windows devices. This book is your ideal companion to study for both exams. Study 100 percent of the objectives for Exams 70-698 and 70-697 Apply your knowledge with hands-on exercises Test your skills with challenging review questions Access videos, electronic flashcards, a searchable glossary, and bonus practice exams The demand for qualified Windows 10 professionals will be high, as more than half of the corporate user base that skipped Windows 8/8.1 is expected to adopt Windows 10. If you want the skills that are in demand, you need to get certified; if you're ready to get serious about the exam, MCSA: Windows 10 Complete Study Guide is the resource you shouldn't be without.